Our Fort Myers injury attorney encourage you to respect the risks of driving through road construction by paying attention and obeying all rules of the road. About half of these collisions occur on the interstate, although arterial roads leading to or from a highway are the site of more than one-third of road-construction collisions. This is particularly true in high-growth areas like Southwest Florida, where local planners continue to race to build roads and other infrastructure capable of handling the increasing traffic demands. In addition to obeying all traffic laws, and driving defensively, there are specific steps you can take to reduce your risk of being involved in a motor vehicle collision in a road construction zone. Don’t Speed: Speed is a leading cause of road construction accidents. Slow down and avoid following too closely to allow for more reaction time. 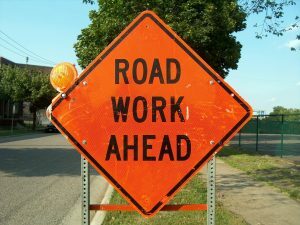 Plan Ahead: Road construction accounts for about 10 percent of road congestion and about one-fourth of unexpected freeway delays. Plan your route and allow for extra time to reach your destination. Obey Road Crews and Signs: Watch for large vehicles entering or exiting the roadway and follow all temporary signs, flaggers and other road-crew instructions. Move Over: Florida law applies to road crews and utility workers, as well as law enforcement. Move over as far away from construction work as possible. Avoid Distraction: Collisions in work zones are caused most often by the unexpected. Avoiding distraction is critical to maintaining your focus on the road while maneuvering through a construction zone. Florida’s Move Over Law is found in F.S. 316.126 and requires drivers to move over and/or slow down when approaching road crews with activated lights or visual signals. An experienced Fort Myers injury attorney should always be called to review these cases in the immediate aftermath of a collision. The nature of road construction means that road conditions change on a daily and sometimes hourly basis. Documenting the conditions at the time of your collision can be critical to proving your claim for damages. Southwest Florida Bikers for Babies Event a Success, Nov. 10, 2018, Associates And Bruce L. Scheiner, Attorneys for the Injured.